"You know what we've got now, don't you? We've got another gut-bustin, mother-lovin' Navy war." Much to the dismay of my father, I have a strong opposition to anything starring John Wayne. Growing up, I was subjected to films like The Cowboys, and North to Alaska on a regular basis and the infatuation that so many have for "The Duke" never made much sense to me. Yet, while watching In Harm's Way, something that can best be described as a miracle took place. I found myself enjoying a film starring the late Mr. Wayne and, while my fascination of anything dealing with World War II was most likely the cause of my enjoyment, I will swallow my pride and say that yes, I admit I enjoyed a John Wayne movie, Dad. 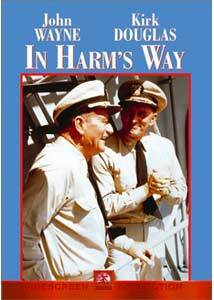 John Wayne is Rockwell Torrey in the film version of James Bassett's novel, Harms Way. Torrey is the admiral of a ship on maneuvers as the attack on Pearl Harbor played out in December of 1941. Quickly, after the horrific bombing, Torrey is ordered to lead a small fleet to attack a Japanese base in the Pacific. The attack goes awry when, not only are several lives lost, but also several ships. The next time we see Torrey he is no longer in command of a battleship, but at a desk after breaking orders. While he is driving this desk his XO Commander, Eddington (Douglas), has found that his wife has died at Pearl Harbor and that she was cheating on him. Along the way, Torrey has to deal with his estranged son, his XO being stationed on a remote island, and a relationship with a nurse. But for those afraid that a love story and a father/son reunion make for no war moments, fear not—there are plenty to go around. Two hours after viewing Michael Bay's overblown love spectacle, Pearl Harbor, I sat down to watch In Harm's Way. What was most intriguing to me was how two films that focus on relationships, friendships, and life in general while a war is being fought, could be so different. In Harm's Way doesn't have the haunting recollections of life away from the war that came with Saving Private Ryan or The Thin Red Line, to cite a few recent examples. Yet it is clear that the moments spent on love and family are more interesting than those spent away from it. John Wayne does a nice job of showing the range of his ability when the story is interesting, both as the hardass officer as well as his relationship with Neal in the more somber scenes. Kirk Douglas gives a nice subtle performance, as both he and Wayne develop well-rounded characters. Supporting performances by the remainder of this all-star cast are also of high quality. Supporting players include: Patricia Neal, Tom Tryon, Burgess Meredith, Henry Fonda, Dana Andrews, Hugh O'Brian, Paula Prentiss, Brandon de Wilde, Patrick O'Neal, Franchot Tone, Carroll O'Connor, George Kennedy, Slim Pickens, Bruce Cabot, Larry Hagman, Barbara Bouchet, Stanley Holloway, Jill Haworth and James Mitchum. Whew! Image Transfer Review: Presented in its original 2.35:1 aspect ratio with anamorphic enhancement, In Harm's Way looks fantastic. Shot in black&white, the blacks are solid with great depth. Detail and sharpness look fine, yet with a black&white picture it is hard to judge several moments of detail. What is most impressive is that that print is virtually scratch and dirt free; in fact, this print has fewer scratches and dirt marks than several recent discs I have viewed. This is an impressive transfer of an older film. Audio Transfer Review: Featuring new Dolby Digital 2.0 and 5.1 soundtracks, In Harm's Way fails to impress in the audio department the way it did with its video transfer. Aside from the attack on Pearl Harbor, the use of the surrounds is nearly nonexistent. The score by Jerry Goldsmith is beautifully recreated across the front and rear speakers for a nice impressive mix that fills the room. Overall, the mix is impressive when considering the source material. Extras Review: Three theatrical trailers for In Harm's Way, as well as a featurette are all that this new DVD has to offer in the way of extra features. The featurette proves that even today, thirty-five-year-old films can still fall victim to the dreaded "extended trailer masked as a featurette" curse. While In Harm's Way isn't a film that I will watch repeatedly, it is still a fine motion picture. I love films about World War II, and while there are several historical inaccuracies, the picture still conveys a good depiction of the war in the Pacific. With a nice video transfer, as well as a small, yet nice selection of extras, this is a decent disc.